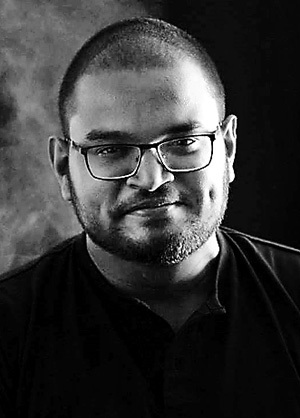 What set out to be a goal to rebuild the Asian vision of a niche subgenre that very few people are familiar with, ended up with science fiction writer Yudhanjaya Wijeratne winning the respect of an international science fiction community. We caught up with the writer, whose story ‘Messenger’ (as part of the Expanding Universe Volume 4 anthology) written in collaboration with R.R. Virdi (Ronnie), was nominated for the Nebula Award under the Novelette category. The Nebula Awards annually recognises outstanding works of science fiction across various categories. This is the first time a Sri Lankan author has been nominated and awarded since Sir Arthur C. Clarke in 1979. At the start, Yudhanjaya wrote when he was in the mood, usually early in the morning or in ten-minute bursts every hour during work. He’d also join informal groups to write in sprints. Eventually though, he realized that he functioned best when he had long periods of uninterrupted time. So he rearranged his lifestyle, choosing not to write on weekdays. On weekends he’d do nothing but write. “Ten hours at a time, sitting, thinking and putting those words down, with only the occasional break in between,” he tells us. Although the process is hard at first, it gets easier over time. There’s a certain mental discipline that you get into, a flow state where only the writing matters. His quest right now is to make this a more frequent part of himself. It’s surreal, being a Nebula Award finalist, he tells us. Perhaps the most drastic takeaway is the feeling of being plunged into the middle of so many other brilliant, enthusiastic writers, all of them professionals in the field. Yudhanjaya adds that writing science fiction both in Sri Lanka and the Indian subcontinent is a lot like walking into Mordor alone – certainly a daunting task, as the whole Lord of the Rings trilogy can tell you. Ever since he started out, Yudhanjaya published a fair bit of short fiction (at least six short stories) between novels. Most of these were in anthologies that not only introduced him to renowned writers in the field, but also helped build his credibility. Since the Nebula is a professional award, writers registered with the SFWA vote on each other’s work. In this sense, Yudhanjaya believes the key to get on the radar of other writers is to be published alongside them. The idea for Messenger was born out of his and Ronnie’s shared appreciation for anime and manga. Somewhere along the line after Pacific Rim 2, which he admits was terrible, they started brainstorming ideas. The main focus of writing Messenger was what it would be like to subvert this narrative and bring the emerging superpowers of India and China into play, and what kind of life forms the monsters would actually be. Yudhanjaya tells us a lot of it boiled down to Ronnie imagining fantastic Lovecraftian monsters and weapons, and him thinking about how the aliens would be built, the kind of mental challenges the pilots would face, and what whether there was some basis in science for the weapon systems. The story is heavily rooted in a few things, one of which is Hindu mythology, specifically the figures of Kali and Vishnu. Another key influence is Neon Genesis Evangelion, a very dark Japanese anime that explores the trauma, personal relationships and the suffering of characters who pilot war machines. There’s also a touch of Chinese science fiction writer Cixin Lui’s Dark Forest theory, though Yudhanjaya explains that it was mainly a gateway to come up with the greater plot of what happens beyond this one story, and why the Earth is being attacked in the first place. Subverting the US-centric idea that aliens will always attack the White House was another key point, as Yudhanjaya tells us that it makes a lot more sense to aim for the centre of population. This was clearly Asia. Depending on how you’d look at it, the story is about giant robots firing uranium-tipped rounds over the Bay of Bengal, or a very dark and horrifying story about depression and revenge. Fellow SFWA writers tell him the book “resonated on every level”. “If you put a gun to my head, I’d have to say it’s probably because we thought about every element we put in there,” he recalls. As a writer, Yudhanjaya’s personal goals are numerous. But when it comes to gaining fame, all he wants to do with it is to help a few of his close friends, who he knows to be very creative. “I want them to finish and publish their work.” Right now his “help space” is limited to ten people. Once they have their foot in the door, Yudhanjaya will move on to the next set. He hopes that somewhere in this process, there would be a ripple effect and that the creativity among people will spread. Eventually, if the plan works out, there will be a tidal wave of future-facing Asian and South Asian narratives next to the usual suspects. But this is long process, and he works with small units. The winners will be announced on May 18 at this year’s Nebula conference, which will be held from May 16–19 in Los Angeles, California.